Felicia Jackson Injured in Pedestrian Car Accident in Savannah, Georgia; Justice and Compensation Available to Ms. Jackson? An accident involving two vehicles injured a pedestrian Saturday afternoon, March 30, 2019. 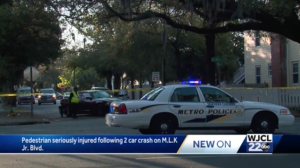 According to Fox28Media.com, “It happened on Martin Luther King Jr. Boulevard and 44th street when two vehicles crashed, one spun away and hit a pedestrian trying to cross the street.” WJCL.com identifies the pedestrian as Felicia Jackson. “[Ms.] Jackson was taken to the hospital with serious injuries” according to the WJCL.com report. The investigation is ongoing according to media reports. As the details of this tragedy continue to develop, and depending on who is deemed to be at fault, Felicia Jackson may elect to file civil claims for her injuries. In addition, any other injured victim may elect to file civil claims for their injuries. Based upon its experience and success handling pedestrian accident cases, The Murray Law Firm suggests that Felicia Jackson should retain an experienced personal injury firm to protect her interests and ensure an unbiased investigation. Photographs of the vehicles and roadways involved and a review of traffic surveillance footage will need to be performed immediately before any evidence is damaged or destroyed. We represent our Clients on a contingency agreement, which generally means that no fees or payments are owed until and unless we recover. Anyone seeking further information or legal representation is encouraged to contact us via e-mail (click here) or by telephone at CALL NOW: 888.842.1616. Consultations are free and confidential. 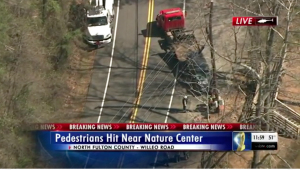 Two Pedestrians Hit by Car Outside the Chattahoochee Nature Center in Roswell; Justice Available? 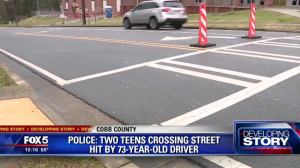 Two pedestrians were struck by a car in Roswell Wednesday, March 20, 2019. According to AJC.com, “[a] car hit two people outside the Chattahoochee Nature Center in Roswell…injuring the pedestrians as well as a 2-year-old girl riding in the car.” The news story reports “the man driving the car lost control and sideswiped another vehicle before hitting two adults,” and then “also struck a power pole.” The pedestrians and the child were taken to a local hospital the news outlet reports. As the details of this incident continue to develop, and if the driver is found to be at fault, the victims may elect to file civil claims for their injuries. Based upon its experience and success handling pedestrian claims in Georgia, The Murray Law Firm suggests that the victims should retain an experienced personal injury firm to protect their interests and ensure an unbiased investigation. Photographs of the roadways involved and a review of surveillance footage from nearby businesses or properties, if any exists, will need to be performed immediately before any evidence is damaged or destroyed. The Murray Law Firm has obtained over $100 million dollars in verdicts and settlements for its Clients, including for victims of Georgia pedestrian accidents such as this one. We represent our Clients on a contingency agreement, which generally means that no fees or payments are owed until and unless we recover. Anyone seeking further information or legal representation is encouraged to contact us via e-mail (click here) or by telephone at 404.842.1600. Consultations are free and confidential. Justice for Victims? Malik Spellman, One Other Student, Struck by Car While in School Crosswalk. Media outlets report the driver has been identified and any charges are pending the outcome of the investigation. As the details of this incident continue to develop, and if the driver is found to be at fault, Malik Spellman may elect to file civil claims for his injuries. In addition, any other victim in the accident may elect to file civil claims for their injuries. Based upon its experience and success handling pedestrian claims in Georgia, The Murray Law Firm suggests that the Mr. Spellman should retain an experienced personal injury firm to protect his interests and ensure an unbiased investigation. Photographs of the roadways involved and a review of surveillance footage from nearby businesses or properties, if any exists, will need to be performed immediately before any evidence is damaged or destroyed.